Identification: This species has a white body flecked with opaque white and with a mask-like black patch confined to the region behind the eye spots. Branches of the digestive gland in the cerata shade from dark green basally to light orange apically. The cerata are decorated with iridescent green to white flecks and have bluish tips. 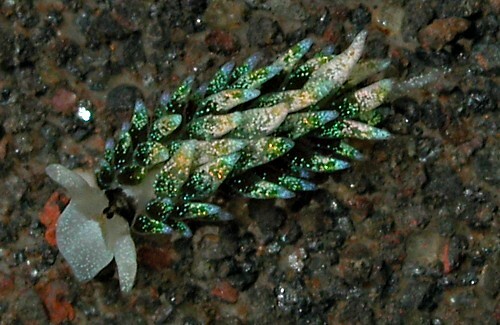 Natural history: Costasiella sp. #1 is a rare species found in moderately protected to moderately exposed rocky habitats at depths of 1-5 m (3-16 ft). Distribution: Maui, Oahu and Kauai: widely distributed in the Indo-Pacific. Taxonomic notes: First recorded in Hawaii from Hekili Point, Maui by CP on June 1, 1991. Photo: CP: 3 mm: Maalaea Bay, Maui; Oct. 21, 2002.